... 2 strips of roasted pork, each costing RM13.50. Brought ALGJ to try out the best roasted pork in town. I wasn’t too sure if the place was open or not because it was Sunday. Our chance was 50-50. Based on my last visit, the place should be closed on today. Anyway, we went to give it a shot after our stroll in Berjaya Times Square. Similar to my previous visits, the taste was pretty much the same. Which was a good thing cause I was here to have some good roasted pork. Though we were quite late (it was already 1pm+), but there were still a few pieces of roasted pork hanging up. I guess Sunday is just a quiet day for them. No wonder they opens every fortnight for Sunday. Please check my previous experience for more details. Went to DoReMi for dinner with AC. This time he finally has the chance to try the fried flat noodle at the siu chao stall. ... honey sweet potato and normal sweet potato. ... both has yellowish inside with the honey one more yellowish. Coincidently, the fried chestnut and sweet potato little lorry was stopping right in front of DoReMi. I decided to try the sweet potatoes as I usually don’t eat these snacks. Since there’s an extra mouth to help eat them, I went ahead and bought a normal sweet potato and a honey sweet potato. AC seems to like them as the sweet potato wasn’t dry, as he mentioned. As for me, I haven’t had them for ages. Pretty nice as the skin wasn’t too difficult to peel. Though most of the meat was sticking to the skin. The honey one was easier to peel. But it was no as moisture as the normal one. Though this was a little more sweet than the normal sweet potato. At the same time, I find it too sweet. So I’d rather go with the sweet potato next time. 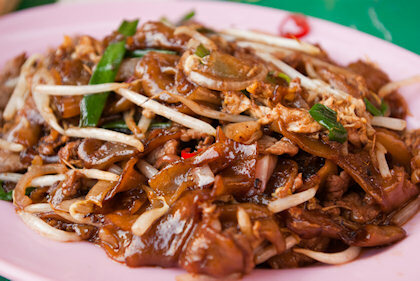 ... fried flat noodle with beef. The first time I had this, it was amazing. The steam was billowing up to my face and it has very good aroma. The fried flat noodle wasn’t too dry as well. Despite being dry fried, it was very moisture and rather oily. But it was nice. Nicer than the too dry fried flat noodle from Taman Paramount. Together with the jalapeno, it reminds me of the fried flat noodle from my hometown, which I missed very much. The first time I tried this food was at the shop itself in USJ9. It was (highly) recommended by EL and AT. Instead of having beef noodle, I had the mutton soup noodle instead. EL recommend me to try the Xin Jiang’s style noodle, but it was cost RM10. I was reluctant at first. Later I found out that there were outlets in many other places, one of them being in Carrefour Subang Jaya. Hence I recommended this to Kuma tonight, after our little shopping spree in Carrefour. ... Xin Jiang's style beef noodle. Soaked in gravy. ... Kuma's beef noodle soup. The gravy has a layer of oil on it, which sorta killed my appetite. I was reluctant on the taste of the gravy at first. Somehow, I find that it tasted like paprik’s gravy, except for the colour of it. The noodle was handmade, it has no hint of alkaline in it. Though I preferred the noodle from the shop, which was not as soft as the one here. The beef cutlets were very sinewy. I expected them to be much better. Along the way of eating, Kuma was complaining that her soup was very oily. Perhaps I’ll give Xin Jiang’s style noodle another try at the shop. It might have been done much better. PS: The whole food court was smelling rather foul. It was 1 of the reasons my appetite was killed. ... store front of the place. ... fried dumplings with mushroom stuffing. ... soup dumplings with vege. ... meat dumplings in sesame sauce. ... steamed dumplings with prawn stuffing. Today, ALGJ and me had breakfast with MSF. MSF said she needed to go to nearby office for meeting so I recommended having breakfast in Glenmarie.We ordered 4 types of dumplings as I don’t want to have a heavy breakfast. Firstly, the fried dumpling hasn’t much mushrooms in it. The vege dumplings were plainly meaty as well. Then the prawn dumplings weren’t just plain prawns. Then the meat dumplings were… pretty meaty. I was expecting crunchy prawns meat in the prawn dumplings, but I was wrong. I guess I shouldn’t expect much from cheap food such as these. ... a little background on the founder of the place. ... this UFO will vibrates and blinks when your order is ready to be served. ... Snowflakes bestseller comes with grass jelly and taro balls. ... after pouring in the creamer. This is my 5th time visiting this place, but only this time I brought along my camera. The first time I came was brought by AC. He recommended me the taro balls (yam flavoured glutinous rice ball). He likes the chewy texture of it. So far, I’ve tried the Snowflake Bestseller, Soya ice set and Taro ball set. Soya ice set comes with shaved ice made with soya bean, while Taro ball set was soaked in sugar syrup, very sweet. Anyway, I preferred best seller because it has the combinations of the 3 sets, which is grass jelly, taro balls and soya bean based ice. Then it was simmered with grass jelly syrup, which has herbs flavour in it. I preferred the grass jelly syrup cause it’s not too sweet. EDIT: AT said the best seller is not soya based ice. So I guess it’s only combination of 2 sets.